In need of water rescue resources? Disasters not only impact our communities but they are becoming more destructive, this is especially true with water related events. Of course, the immediate concern is the loss of life, survivors (some who may have been injured during the disaster), traumatized, and not able to safely conduct a self-rescue. 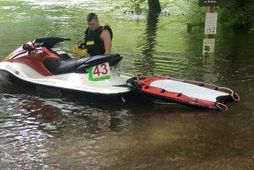 Southern Technical Aquatic Resource and Rescue (STARR) water rescue team has highly trained, dedicated, and devoted members that can respond to water related disasters rapidly and effectively. Our primary gold during a water related event is to respond as a FORCE MULTIPLIER and with ADDITIONAL RESOURCES to assist PUBLIC AGENCIES IMMEDIATELY in performing rescues of those individuals who are in danger due to rising flood waters and that of swift moving water. STARR is a 501c3, non-profit, FULLY INSURED, professional team with certified water rescue personnel that strictly follows the guidelines that every professional water rescue team follows – Incident Command System; FIRESCOPE SAR; FEMA Swiftwater Flood Rescue Team Typing; FEMA Typed Resource IMR; FEMA Schedule Rate. Our team is able to deploy resources within 2 hours, check-in with local resources in less than 16 hours of OFFICIAL notification and/or request, and remain self-sufficient for 48 hours (food/water). However, STARR CAN NOT respond to any emergency or disaster WITHOUT OFFICIAL REQUEST authorizing our team to deploy. This protects our organization, maintains accountability / liability, in good standings with the Incident Command System, Continuity of Operation, and ensures the safety of those responding. 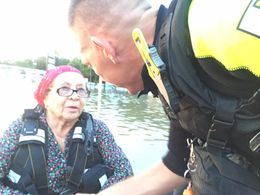 In the past events, volunteers, with big hearts but little to no training, have self-deployed to areas affected by flooding only to be turned around, in some cases arrested and equipment impounded, or asked to leave by government officials even though calls for help and to 911 overwhelm trained responders. 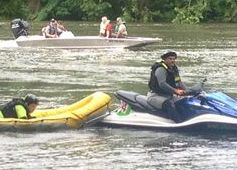 Water rescue is very dangerous even when properly trained, it has many unknown factors / hazards that training helps individuals prepare for, but those who have a boat and “been on the water all their lives” probably never had to deal with the concerns with moving flood waters – until now. STARR CAN NOT go to a water related emergency/disaster without the necessary authorization/documentation as this can lead us to wasting valuable time, man-power, and/or much needed rescue resources not arriving. Lastly, STARR’s executive staff, of trained and educated Emergency Managers, is willing to meet with county/parish leaders to implement their of the describe Memorandums (MOU or MOA) prior to events occurring where our resource can deploy when that water related incident happens. STARR will provide a Mission Ready Package to any requesting agency to include insurance documents. In August 2016, historic floods devastated parts of south Louisiana after a slow-moving system dumped more than 20 inches of rain in parts of East Baton Rouge and nearby parishes in a three-day span. After the unprecedented rainfall, all of that water began its journey south, swelling rivers and flooding thousands of homes. Record rain levels exceeded more than 20 inches in a 48 hour period, while accumulations of over 31 inches were reported just northeast of Baton Rouge. Gov. Edwards declared a state of emergency Saturday, calling the floods "unprecedented" and "historic." He and his family were even forced to leave the Governor's Mansion when chest-high water filled the basement and electricity was shut off. Over several days more than 20,000 people were rescued by first responders. STARR had several team members who responded to the call for help from the Bossier Parish area.